CVSRT - CVSRT Trainee Members Six-month Assessment. 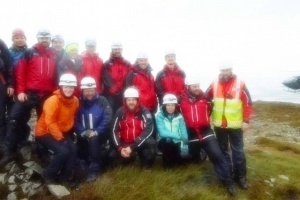 CVSRT Trainee Members Six-month Assessment. 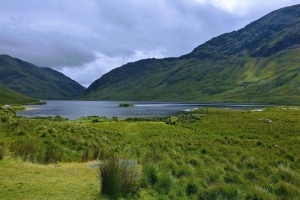 Reek Sunday, County Mayo, Republic of Ireland. A ballistic flight from England to Ireland. 50minutes in the air, barely enough time to get the trolley around let alone drink the two bottles of wine the woman beside me buys. We land at Knock International Airport with a runway built to 747 landing standards so the Pope could land to visit the Basilica. Welcome to Knock Airport, gateway to Croagh Patrick, Curach Phádraig, the mountain of Saint Patrick. To the locals, ‘The Reek’. Car hires collected, turn left off the airport grounds straight onto a single track road with passing places, turn right onto a narrower road with no passing places. Not exactly the easiest airport to access in the country. Eventually we join the N5, and off to the hostel at the base of the mountain. It would be another 40 hours before we’d get a glimpse of the top since it was hidden beneath the clag from the moist air driven up from the Atlantic. 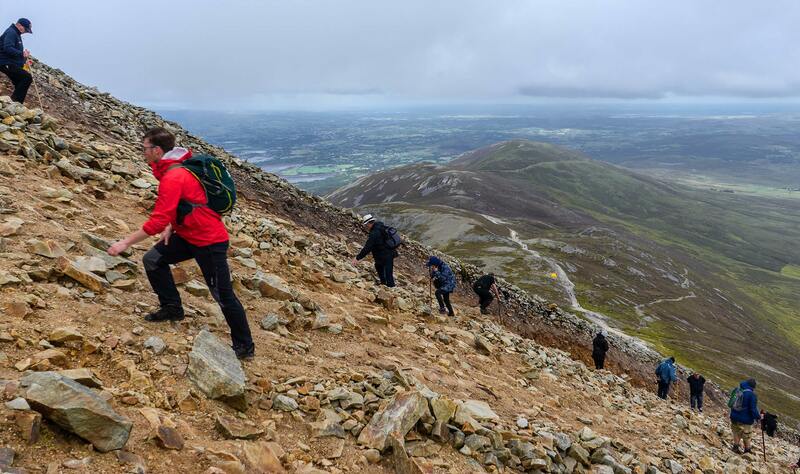 With its top less than 1km from the sea, and rising 764m from the coast, Croagh Patrick is notorious for poor weather. 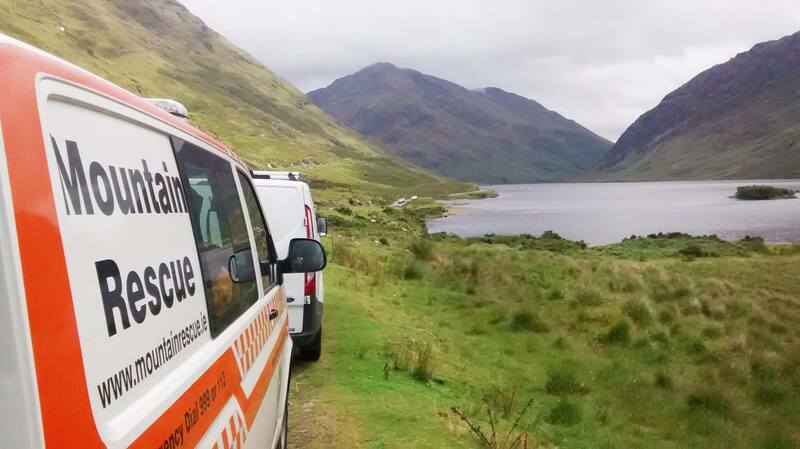 With an average gradient of 28 degrees and its steepest section at 44 degrees, this was where we were to be stationed with other mountain rescue teams from across Ireland for the holy day of pilgrimage called Reek Sunday. 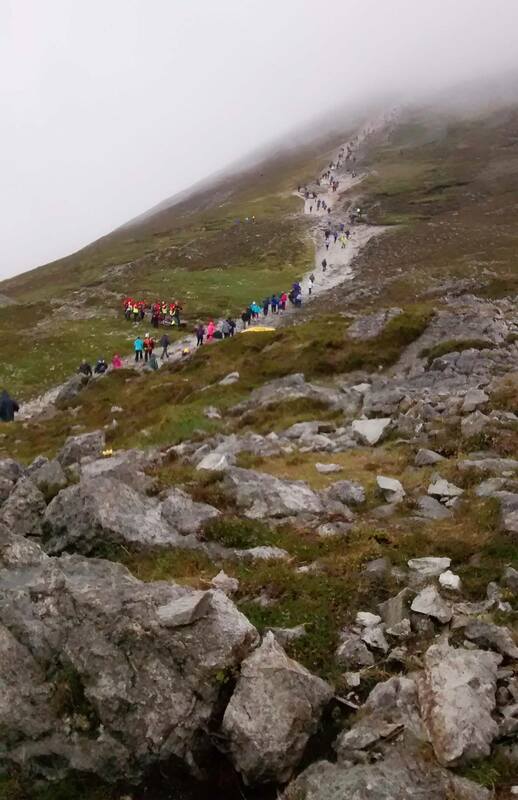 Reek Sunday pilgrims follow the path of Irelands patron Saint Patrick, who is said to have walked up the mountain barefoot, to sleep at the top and perform a service at sunrise the next day. No pagan connotations obviously. 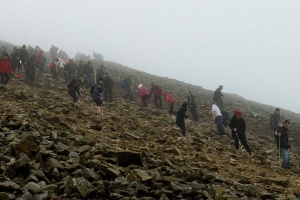 Pilgrims do the same, walking the mountain, many barefoot, at some point over the last weekend in July. Many make the ascent to attend one of the hourly masses performed at the summit church. 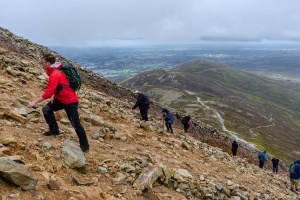 Numbers have declined in recent years and long gone are the heydays of Reek Sunday where over 50,000 people could be expected on the mountain. After a break from travel we made our way to dinner at the local eating pub. Another short trip to the drinking pub, where we were due to meet members of Dublin & Wicklow Mountain Rescue Team (DWMRT) and a few more local beverages before bed. Saturday morning, everyone ready, vehicles packed, and off we were to Doo Lough at the base of Ben Bury to train with the DWMRT kit that we would be using for the weekend. Different stretchers, team calls, movement patterns; all had to be worked through so we could function as one on the mountain on Sunday. A few hours working, talking, grunting, pushing and lowering, and it was time for lunch at the local farm shop. Food ordered, chatting with the owner who was stunned that we had come over from Yorkshire, before being told that food was on the house for everyone. We were stunned and appreciated the generosity, each of us leaving a substantial tip to cover part of what we gorged. Back to the hostel and people’s feet were getting itchy for the mountain. Five of us ditched kit from our bags, stashed our MR branded gear and went for a fast moving hike up the mountain. An hour and twenty minutes later we were on the top. It was sinking in how difficult a mountain this was going to be to perform a rescue off with the constantly moving scree and boulders of the Cone. A poor weather forecast for the day ahead was going to give us a very tough day with high probability of no helicopter cover. Before we descended we were treated to a break in the clouds and the view over Clew Bay. Looking down we realised how arduous a walk this would be for the pilgrims the next day, many of whom you would not class as hill walkers, let alone members of our outdoor community. Gear was packed away, bags ready for the early morning start, before we drove to Westport for a team meal with CVSRT and DWMRT members. Three courses later, bloated and sleepy we were told to put our money away as the Dublin & Wicklow team were picking up the bill. Again, random acts of kindness were truly appreciated. 9pm, a final kit check, hill food made, bags into the car for a 2am start. Bedtime. 0200 – Up, kit on, toilet stop #1, coffee, second coffee, toast, third coffee, toilet #2. 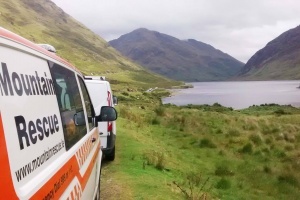 0230 – In the car, roll from hostel towards Mayo Mountain Rescue Team base a 40 minutes drive away. 0320 – Coffee, stew for breakfast. 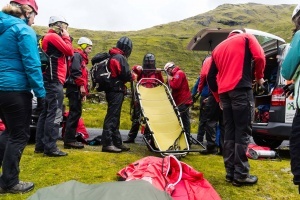 Unpack team kit and split among all members, pack the rest onto the stretcher with carry strops and wheel attached. 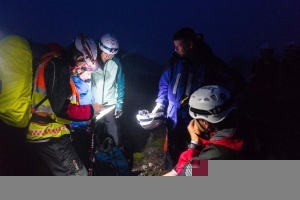 0400 – Leave the base, head up the first part of the Reek, a bog, tussocks, drag kit up. 0455 – Reach the shoulder, head for med tent, 300m vertical height gained, rest for 10mins while waiting for deployment. 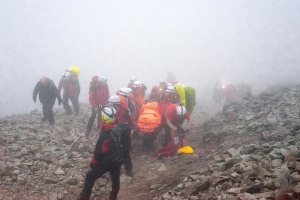 We know we’re going to the top, DWMRT always get the top. 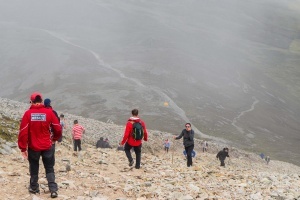 Pilgrims are already walking to the top in the traditional ascent at night. Some are more ‘worse for wear’ than others, maybe a few too many drinks under their belts!? 0505 – Radio shout to deploy to the top, surprised? …not at all. Thank you sir, may we have another? 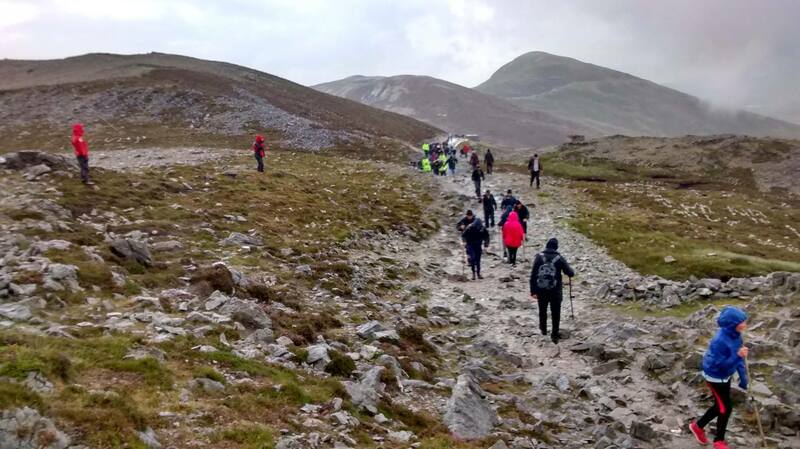 0600 – In position 60 minutes earlier than any previous year, worked very well as a team despite the amount of walkers already coming down from the summit. 400m height gained. Very tired now. 0600 – 0730 – Spread across the summit and 100m below the summit. Sat in a group shelter talking with other DWMRT members, occasionally looking out to make sure no one was injured or requiring assistance. Relatively quiet, but constant stream of pilgrims. Likely lads in local football jerseys come past fresh from the nightclub, chanting something unprintable about pilgrimage and penitence. 0736 – Redeployment to the base of the cone…400m below us. We redeploy 200m lower at a known hotspot that wasn’t being covered at the time. Lowering the stretcher on a V-belay with kit in a body-shaped bivvi bag, which raised a few eyebrows and quite a few explanations needed to passers-by. UK accents garner some very confused looks from the locals. The legacy of Cromwell is not forgotten easily in these parts. Local belligerence is amusing to our fellow Irish MRT members. 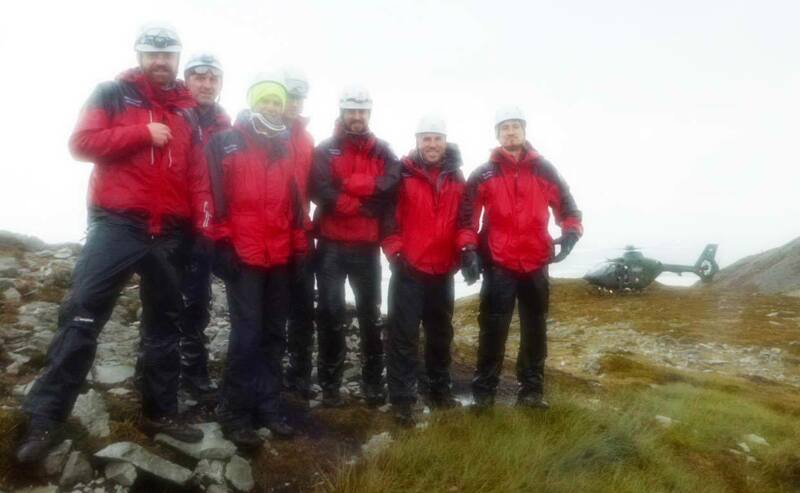 0800 – 0915 – Group shelters again, out of the fall line while the weather turns grim. Four shelters in a row like a line of giant mutant Skittles. Lots of people now, constant stream of them, very quiet, visibility about 20m at best. 0900 – We get out to stretch our legs. Visibility up to about 40m and we spent some time out watching the parade of silent, focused ‘zombies’ trudge past with the occasional stumble. The odd person takes the faster, safer fell race route down. 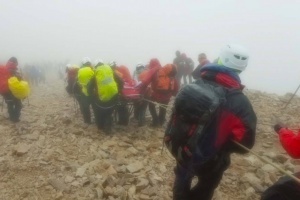 0900ish – A fast descending walker takes a fall, lands face first, tumbles a further 20m before coming to a rest. We wait to see if he gets up. He doesn’t. DWMRT member crosses the moraine to him. Arm flag, paramedic crosses. Arm flag, two more over, two more up to stop falling rocks and move people out of the rock trap above. Rest of us strip the stretcher for med kit, and ropes. It’s a definite carry out. We’re on a 40degree gradient with a lot of loose rock above and below us. 0900-0930 – Bleeding stemmed, arm and shoulder splinted, pain care underway. 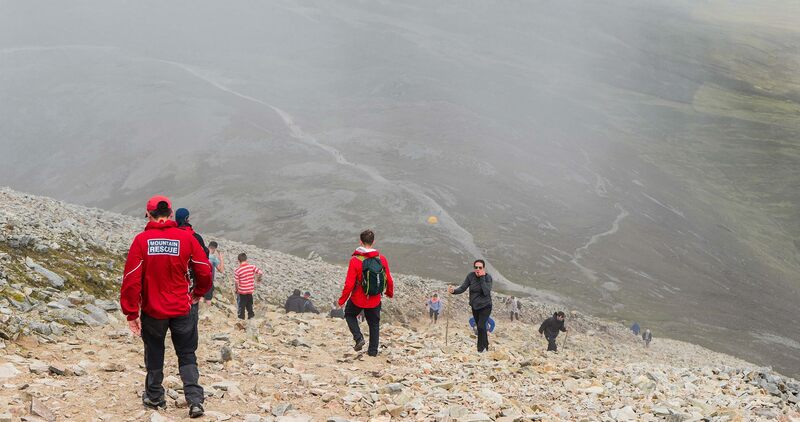 We move across moraine with all team kit, pilgrims are kindly persuaded to move aside so we can get there. 0930-0945 – Patient packaged, medication administered, a lot of screaming, kisu doing well as a visual block. Many people walking over to see what’s occurring, politely asked to move along just in case they may get hit with a rock from above. They only move when we point out their safety. At some point, the clag started to lift and we heard a helicopter inbound. A Coastguard S92 landed, we made direct contact to find out if we could use it, sadly it was for a casualty with a cardiac that had occurred. We were notified that 5 incidents had occurred within 20mins of each other. 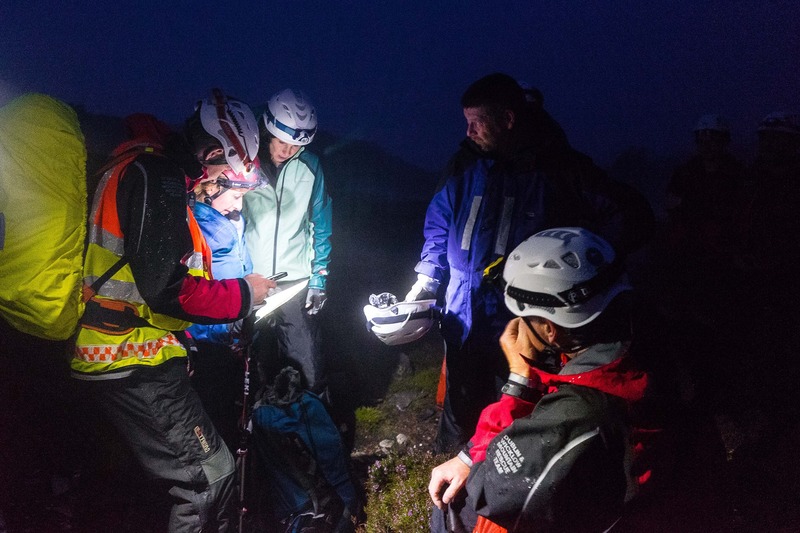 ICRO – Irish Cave Rescue, were acting as runners trying to get more kit on the hill where it was needed. 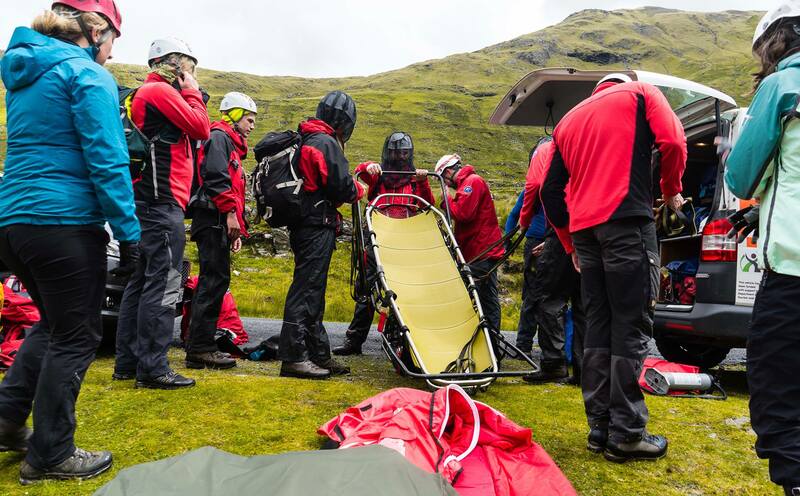 0945-1030 – Moving belay with 10 on a V back rope attached to stretcher with 6 out riggers and one navigator/person herder at the front. Strenuous moving the stretcher down the steep slope with meter high steps where brute force is the only option. Regular stops to check the casualty’s ABCs and reassess what we were planning. Finally, flat ground, wheel stretcher to med tent. As we arrive at the med tent, we are told we’ve an inbound helicopter from the Air Corps - worried about the head injury the casualty had sustained, immediate air evacuation is advised. 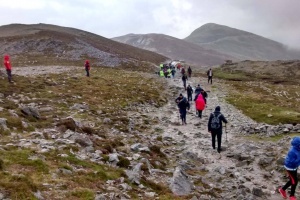 Looking back, we see two more teams split and head for a single point high up the hill, a sixth injury. All stretchers are currently occupied. 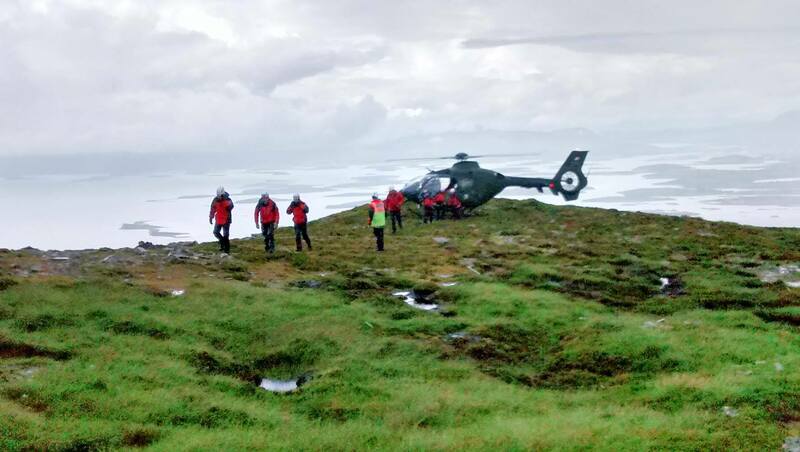 New teams are moving up for shift change and go into action, moving their kit into place having had no rest from the initial movement from the ground level base to the shoulder of the Reek. They get a further 7 injuries in the next 6 hours. 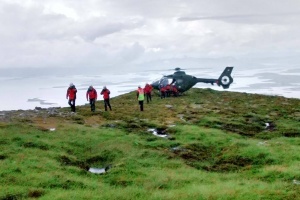 Coastguard and Air Corps helicopters provide amazing air support when the weather allows it. 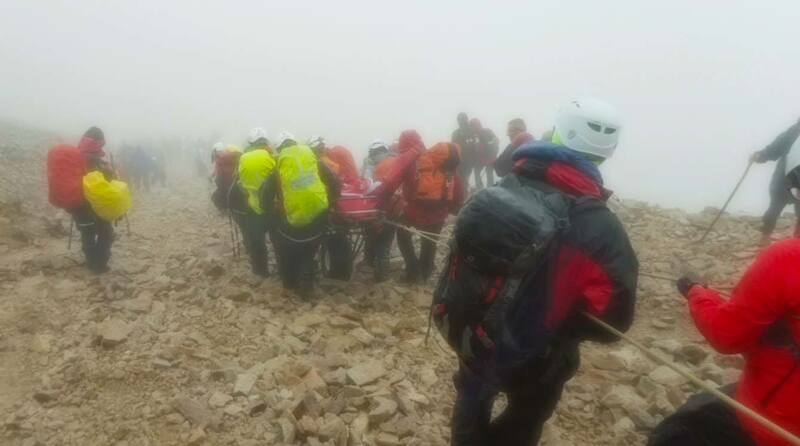 We were very lucky that the casualties happened later in the day when the clag lifted. 1035 – Quick team briefing on the helicopter type we have inbound. Military craft we don’t normally deal with. Smoke popped. Heli lands hot and stays hot. Casualty transferred to heli stretcher. Paramedics handover. Load casualty onto heli, downwash directly under rotor is less than a S92, which was not as bad as expected. Casualty is flown direct to Castlebar hospital for urgent medical assistance. 1050 – We end our shift in 10mins. 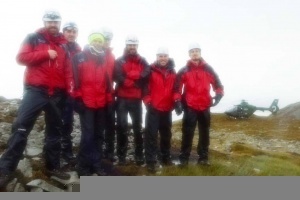 Team debrief from DWMRT paramedic and Team Leader. 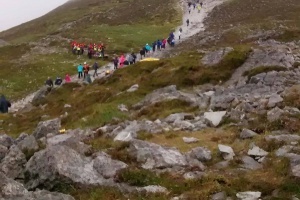 Repack stretcher to leave the Reek. Radio to control base that we are off-call. General feeling of being a useful member of society prevails in the team. Time to walk off. Pack kit again. 1140 – Get to car, change into dry clothes, eat two bowls of stew and a packet of Fruit Pastels. 1200 – Drive back to airport. Ditch rental car. Check in. Drink a beer. Get on plane. Sleep.